Players 8, 9, 10 or 11yrs Play Now! 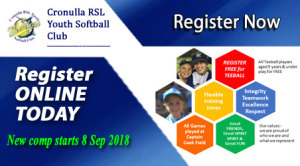 Cronulla RSL still has a few spaces available for children who are 8, 9, 10 or 11 years old. Join up today & have fun with friends, all games Saturday morning at Captain Cook Field, Woolooware, phone Joanne today on 0404 205 415 & let’s get registered.